Dawn Benson produces stylised, figurative sculptures in bronze and bronze resin. Most of her sculptures are based on families and relationships. Being a mother, much of her inspiration is drawn from experience. In the intimacy groups the figurative sculptures are sensitive and loving. 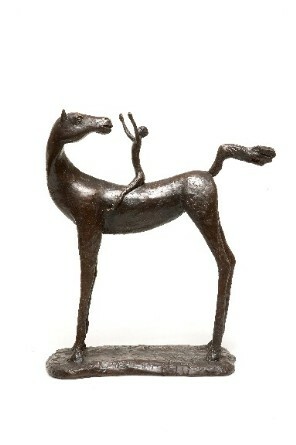 She also captures the deep bond between children and horses, and these sculptures are much sought after. There is a myriad of feelings and emotions that I wish to explore, both dependant and interdependant. I also produce work to commission, both private and corporate, so if you have something you would like to discuss as a possibility, please do get in touch with me. Initially I work on a small scale but work can be scaled up to produce outdoor or monumental sculptures. Dawn brings a touch of tension, humour and sensitivity to her work.